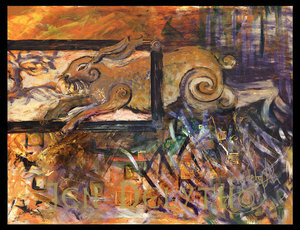 This painting is inspired by a vision of the Hare Leaping through the flames of inspiration. In folk lore, it is said that when the farmers burn the stubble in the fields - to regenerate the earth in Springtime - the Hare is often seen to run into, rather than away from the flames, and yet is not burned, and is reborn. Here the magical Hare leaps through the window of our imagination, of our psyche, through the flames of inspiration that give him new life. The Hare was also believed to self-sacrifice himself within the fire - giving his life for the assured rebirth of the earth. The Hare is associated with Eostre (or Ostara) - an Anglo-Saxon Goddess of the dawning East, and of springtime (from whom we derive the name for Easter), who was believed to have taken the form of a rabbit, or white hare, which is her totem creature.